Final blog from my visit to Burma last week – including meeting Aung San Suu Kyi. Also available here. Last week I spent 2 days in Burma, the last foreign country I will have visited as the UK’s champion for tackling violence against women and girls overseas. And what a fascinating 2 days it was meeting Burmese civil society groups, women’s rights campaigners, government ministers as well as the iconic Daw Aung San Suu Kyi. Burmese women suffer discrimination and violence as the direct result of decades of military rule and conflict, and due to widespread displacement. In Kachin State and Rakhine State in particular, there are reports of women and girls being raped, tortured and trafficked. The restrictions on the freedom of movement put on the Rohingya people in Rakhine means they are even more vulnerable to violence – so not only are they ineligible for citizenship, vilified by extreme Buddhists and kept out of basic education and healthcare, they’re trapped too. And Burmese women have little to no access to human rights protection or justice, and they are grossly under-represented in public life. Only 6% of parliamentarians are women and there are very few women at the top table in the national peace negotiations. So for me, the big questions I wanted to explore in Burma were these: What hope is there for Burmese women and girls from all ethnic groups? Is there any hope that President U Thein Sein’s reforms will include improving their lives? No one could answer these questions with complete confidence after just 2 days. But what was clear to me is that right now there is a window of opportunity, a moment that could be seized, that really could make a big difference to the lives of ordinary Burmese women and girls. And here is why. Since 2011, the new government has signed ceasefire agreements with 14 out of the 16 main ethnic armed groups, released the majority of political prisoners (though not all of them), suspended censorship (though not intimidation of journalists), eased internal travel restrictions and endorsed the Preventing Sexual Violence Initiative (PSVI), spearheaded by the UK government. 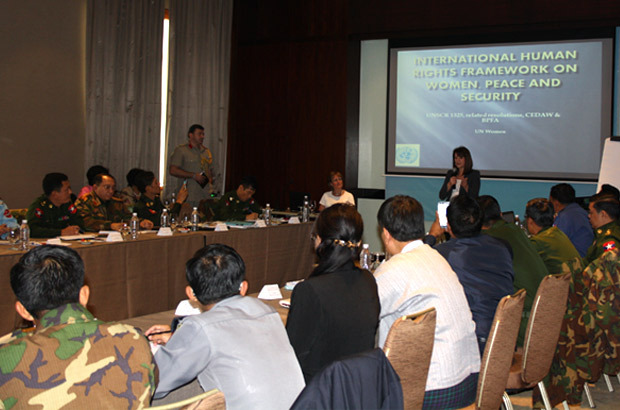 Indeed, on Friday I observed a UK Defence Academy training course for the Burmese armed forces, police and senior civil servants on international law including UNSCR 1325 on Women, Peace and Security. In parallel, civil society is gaining a greater voice in Burmese society. On Thursday I visited a PSVI-funded legal clinic, run by ActionAid, for women who have experienced sexual and gender-based violence. The clinic is training female paralegals to provide legal advice and referrals to victims, and male youth leaders to influence men and boys in their communities to abandon the old ways and respect the rights of women and girls. 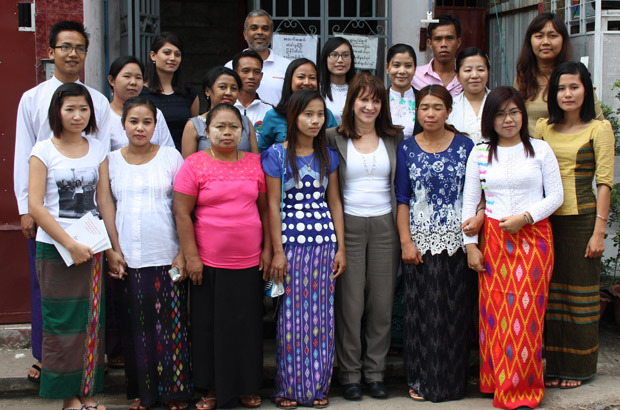 I met some of these trailblazing paralegals and youth leaders and was so impressed by their dedication and leadership to change Burma for the better. I also held a roundtable with women’s rights campaigners, including the Women’s League of Burma and spoke with a group of young female peace activists from around the country about their fight for an equal voice in the peace process and political reforms. More evidence of the window of opportunity for real change in Burma is that an unusual degree of attention is being paid to the international community and Burma’s reputation within it. And there is a lively debate about how the UK should engage with Burma, among people inside and outside Burma. This was a major discussion point during my meeting with Daw Aung San Suu Kyi, Burma’s most popular, famous and inspirational politician. She is supportive of DFID’s work in Burma, especially our bottom-up approach on working to strengthen civil society and local communities. But she is concerned that the international community is giving too much leeway to the current Burmese government, and I agree that getting the balance wrong is all too easy. Nevertheless I ultimately agree with the Commons International Development Committee, chaired by my colleague Sir Malcolm Bruce, which looked into the UK-Burma relationship last spring in light of the recent reforms taking place in Burma. The committee endorsed the Coalition Government’s approach of supporting reformers in the Burmese government to raise the country out of poverty, develop the economy and build a society that moves towards democracy. Overall, all the Burmese people I met had one thing in common – they are all dedicated to making their country a better place for all Burmese people and they are making a noticeable difference. Even “just” breaking taboos and starting a national conversation about gender-based violence is a major step. In a country where most people would say it just doesn’t exist, a national conversation would be an enormous step in the right direction. While you were enjoying your trip in Burma, important things were happening within your brief back at home, it seems.